When journalist Bill Carter discovers traces of arsenic in the soil of his family garden, residue from a century of copper mining in the small town of Bisbee,Arizona, he sets out to learn as much as he can about this metal, its unique properties and the vital role it plays in our lives. In his search, he discovers its many potential hazards, both to our health and to the environment, and after detailed research and scores of interviews with miners, scientists, financiers, and CEO's, he weighs the pros and cons of this valuable research that so enriches our lives despite the grave risk that surface removal mining poses upon the world's last remaining wild places, our water, and our health. With crisp, informative prose and insightful personal observations, combined with Carter's dogged persistence to learn the truth, Boom, Bust, Boom joins the ranks of the works of Barry Lopez, John McPhee, and Bill McKibben as an enduring classic of environmental journalism. "Boom, Bust, Boom, if you pardon the wordplay, booms. It pops off the page as adventure, troubling history, ecological warning, travel narrative, even a bit of horror." "Bill Carter has extracted something that remains all but unnoticed by most people-copper-and told and incredible story about this amazing metal. Boom, Bust, Boom is the best sort of journalism: beautifully written, rich in detail, and impossible to ignore"
"Bill Carter's new book is utterly engaging. I want to use the words fabulous and hearty. We often think we know the world, but then we read a book that tells us we didn't. Carter is a determined investigative journalist and shows the grave dangers the cop"
"Copper is the curse of the Southwest. Bill Carter's blazing book takes us to the crime scene where our lust for things murders the Earth. Time to kill the cell phone, leave Twitter to the twits, and listen up." 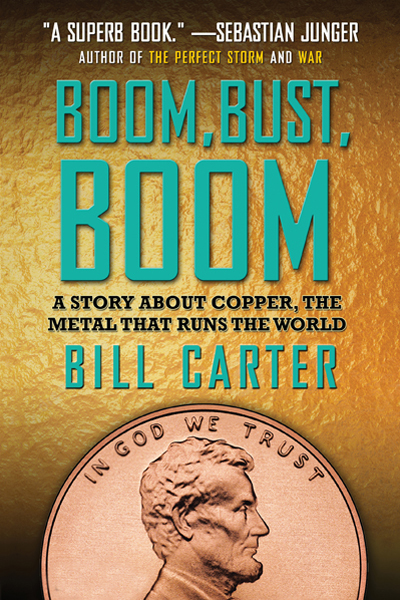 "Boom, Bust, Boom, is Carter's powerful narrative about his pursuit of "the metal that runs the world" and how far we will go to get it. Carter is not a preacher of environmentalism nor a corporate apologist. He just wants to understand." "Carter's scope is large, but his storytelling technique is up-close and personal. In the end, the author decided to move his family out of his beloved Bisbee to escape the threat of a reopened copper mine, but he makes it abundantly clear that there is, f"
"Face to face with environmental risk, Mr. Carter is determined to learn more about copper. He quickly stumbled upon a paradox: Copper mining may be an environmental disaster, leaving behind mountains of waste laced with heavy metals and polluting rivers w"
"This well-researched narrative describes how copper is found in all corners of the world and every facet of our lives. The author journeys to towns in Arizona and Alaska where the specter of new copper mining has drawn battle lines between people who are "
"Masquerading as the story of his personal journey from Bisbee to Flagstaff, Boom Bust Boom is a riveting expose of the bounty and devastation that is copper -one of the most ubiquitous elements in the modern world. From copper's myriad everyday uses to th"
"Threaded through his richly textured account are two existential questions. The first, prompted by his anxiety about Freeport's future plans, is like the old song by the Clash: "Should I Stay or Should I Go?" The second is whether he can reconcile his mou"
"Bill Carter's "Boom, Bust, Boom" is an idiosyncratic but compelling examination of the mining of copper, which is vital to modern communications, but at a daunting environmental cost." "This volume on copper may be the most important book you'll read all year. Boom, Bust, Boom: A Story About Copper, the Metal That Runs the World emerged from one of those "A ha!" moments, when you wake up one day and suddenly smell the coffee."